Veja a Coluna de Orlando, o Campanário da Cidade, o Palácio do Reitor e a Igreja de St. Blaise. Centro Histórico de Dubrovnik: Passeie pelas ruas revestidas de pedra calcária do centro histórico de Dubrovnik com seu guia, enquanto obtém um profundo senso e conhecimento da história durante este passeio a pé de uma hora e meia. Tenha uma visão privilegiada dos locais e pontos de referência nesta cidade impressionante: conheça a história por trás da Fonte de Onofrio, a estrutura circular em que os locais costumam saciar sua sede. Veja o Mosteiro Franciscano e sua escultura Pieta restaurada, bem como uma das farmácias mais antigas ainda em funcionamento na Europa. Em seguida, desça o Stradun, o principal caminho de pedestres na Cidade Velha, até o Palácio Sponza, na época da Renascença, hoje lar dos arquivos estaduais. 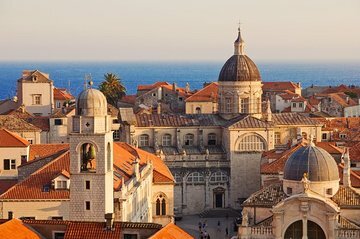 Aqui você também verá a City Bell Tower, o Palácio do Reitor, a Coluna de Orlando e a Igreja de St. Blaise, a padroeira de Dubrovnik. Espere ficar maravilhado e deslumbrar seu guia com a história da cidade para você. Excursão Histórica de Andar pelas Muralhas da Cidade Antiga de Dubrovnik: Navegue pelas muralhas da cidade com seu guia local e ouça fatos e histórias surpreendentes sobre as espessas paredes de 25 metros nesta excursão a pé de duas horas. Aprenda a história das imponentes muralhas do século XII (taxas de entrada não incluídas) e aprenda sobre algumas das invasões e invasores que as muralhas pararam. Lentamente, caminhe pelas paredes, obtendo uma vista magnífica da Cidade Velha e do cintilante Mar Adriático azul. Tenha uma visão do Fort Revelin e da Minceta Tower. E, em seguida, terminar o passeio em Fort Lovrijenac, o único forte que pertence às muralhas da cidade, mas é fisicamente separado delas (taxa de entrada incluída com o bilhete das muralhas da cidade). * Taxa de entrada para Muralhas da Cidade não incluída no preço. fantastic experience, a great way to see the city and surrounding area. lovely, friendly, and informative guide. don't forget your sunscreen. Nice way to get overview when you get into Dubrovnik. The Guide was very good and gave a personal insight into the effects of the fire, earthquake and war. Beautiful! 5 Stars for the Ancient City Walls walking tour / 2 Stars for the Old Town walking tour. General feedback and advice is below. Skip the Old Town Historical Walking Tour and just purchase the Ancient City Walls Historical Walking Tour. Much of the information presented on the Ancient City Walls tour was repeated on the Old Town tour but the views from the Ancient City Walls were much better. You'd only miss a few things by only buying the Ancient City Walls tour and the items you'd miss can easily be done or discovered on your own with a guidebook or by purchasing the 9 museum pass. - We did the 5:00 pm tour and it was definitely the best choice. The temperature was cooler, there was a bit of a breeze, and the views as the sun was setting were great. - We had a great guide who kept everyone moving but still allowed us enough time to snap photos and appreciate what we were seeing. - The commentary provided by our guide offered valuable and timely information about the sites we were seeing. - The Ancient City Walls are a popular tourist attraction for a reason. They're beautiful in their own right, have wonderful views, and offer a great opportunity to hear about Dubrovnik's history but yes, they are crowded. You will be among many other tourists on their own and in groups. - It takes about 2 hours to walk all the way around the walls. - Make sure you know if your tour includes the admission prices for the walls or if you will buy that separately on-site. - Stay toward the front of your group, near your guide whenever you can. The headsets only work within a certain range so if you fall behind you'll miss a lot of the information and just listen to a lot of static. - The places selling drinks and desserts on the walls are really overpriced. I'd skip them and get something elsewhere if you can wait until after the tour ends. - Wear shoes that are suitably comfortable for walking. You'll be standing or walking for at least 2 hours. - Bring a hat or at least sunglasses. Wear sunscreen too. It's very sunny up on the walls and there is extremely limited shade. - Don't throw out your admission ticket to the walls. You have to show it again halfway through the tour. My wife and i were so delighted joining the tour , guided by Marco, to understand how and why Dubronvik had to build the Wall that way. He even explained to us the civil war in 1991. It was a very interesting tour that you couldn't afford to miss when you travel in Croatia. Brilliant tour of the Old Town with Marco in the morning, a true Croatian with excellent English. Knowledgeable and very engaging with the group. Afternoon tour of the walls was ok, spoilt a little by the headset coverage. Worth doing as well though ! Our Old Town tour guide, Marco was Great, very informative and we enjoyed his way of telling us the history. You should have a lot of guides like him! Both guides were outstanding and very informative. We took the morning wall tour which I think was a good choice since the walls were not too busy and it was not too hot. We chose to do the 6 pm old town tour which was nice but it did get dark which made some of the sites hard to see. Lots of walking and stair climbing especially on the wall tour which took about 2.5 hours. Try to book your tours when there arent' too many cruise ships in port you can research this on the internet. This is a MUST for all first visits to Istanbul. Ozlem was a fantastic guide and was able to fit in the Cistern to our tour as well (fee not included but so worth the 20 TL! ).